You can't have Haitian food without sampling the infamous griot. 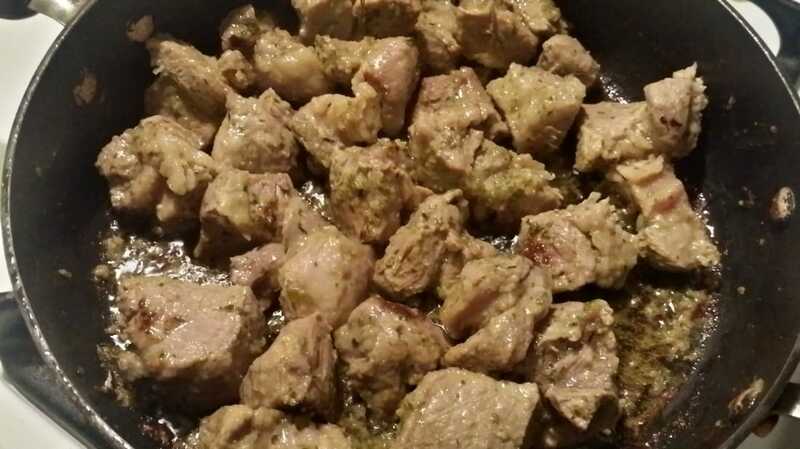 Seasoned, tender, fried pieces of pork that can be enjoyed with "pikliz" and "bunun peze". Every Haitian restaurant has this on their menu, it's a very common and popular street food in Haiti, and if there's a party hosted by Haitians, you better believe that they'll have a tray of this stuff there. 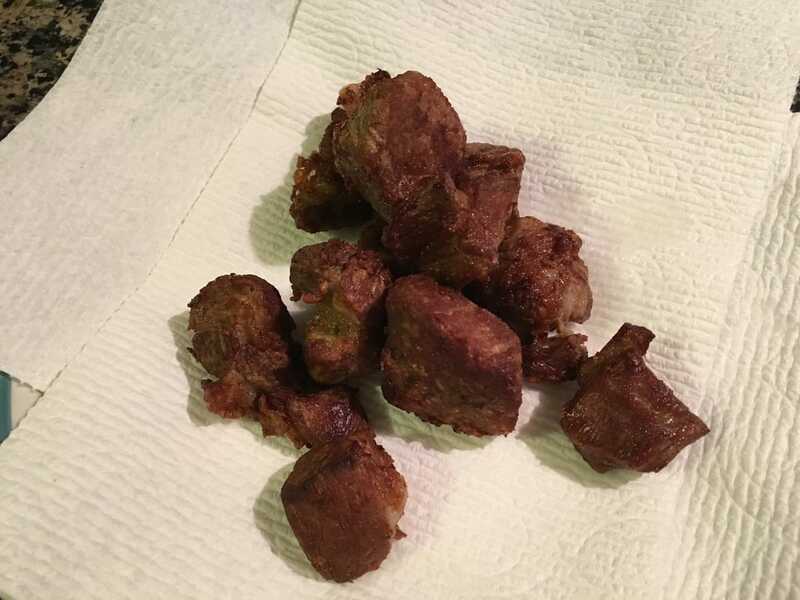 Griot is made from pork shoulder roast and cut into large chunks. My version is made with a few simple ingredients. However, the most important one that is necessary is sour oranges. If you can get your local butcher to cut up the pork shoulder for you, have them do it since they have the equipment to cut through the bone. Request that they are cut into 1 1/2 - 2 inch chunks. When they cook, they will eventually decrease in size so you don't want them cut too small. If you're stuck having to do it yourself, trim off the excess fat and cut it around the bone. 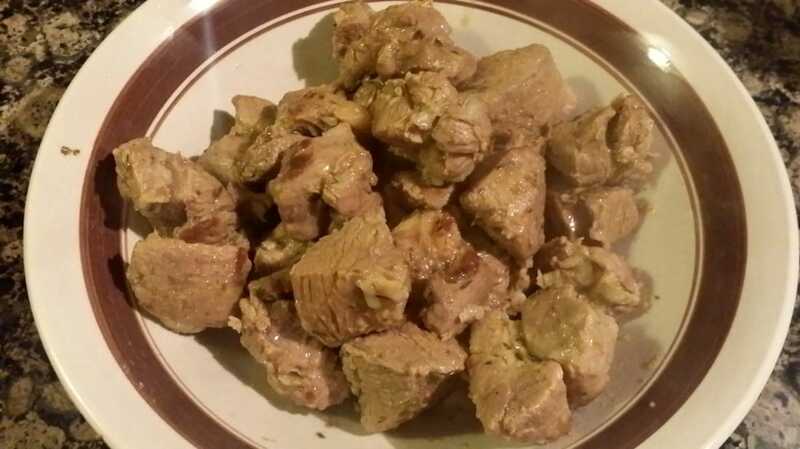 The only benefit of doing it yourself is that your griot will be boneless. I purchased a roast that was nearly 7 lbs and cut it into pieces. This recipe calls for 2 lbs, a decent amount if you're wanting to try this for the first time. 1. First step is to clean the meat. In a bowl, combine 1/2 a cup of the juice of sour oranges, a generous amount of salt, and enough water to cover the meat. Mix and let it sit for about an hour. 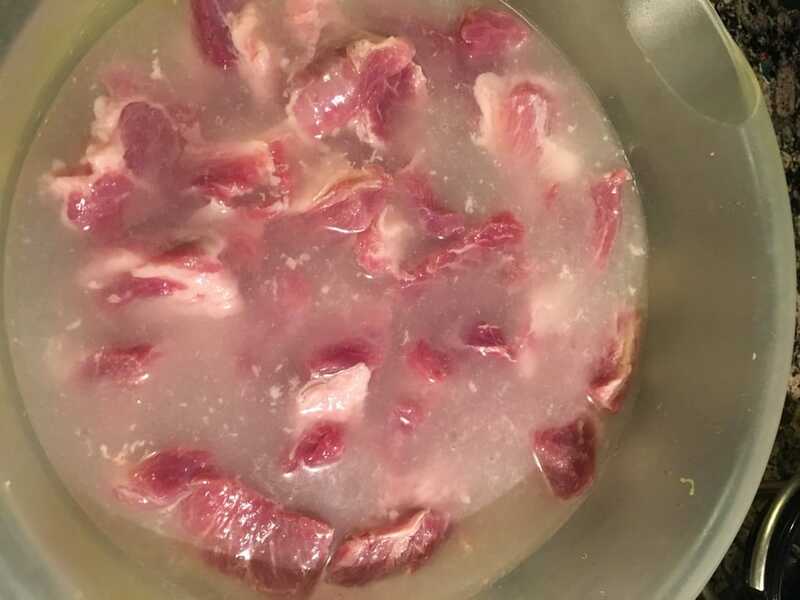 After an hour, dump contents into a clean sink and rinse off each piece of meat with cool running water, squeeze out any excess, and return to bowl. You may also refer to the "Cleaning Meat" page. 2. In a small bowl, add 1/2 cup of the juices of sour oranges and 1 Maggie chicken bouillon cube. Microwave it for 30 seconds. Afterwards, crush the cube to get it to dissolve in the liquid. Add 3 tbsps. of epice to the bowl along with 1/4 tsp. of Adobo. 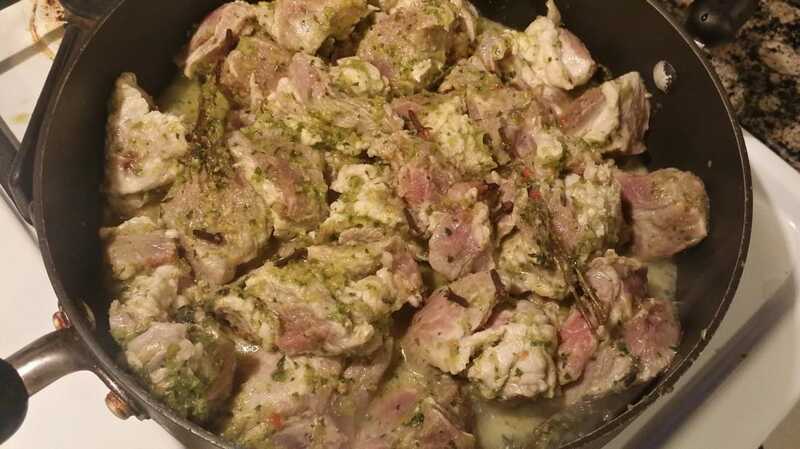 Mix the contents thoroughly and add to the cleaned pork shoulder meat. Throw in a couple sprigs of thyme and mix everything together to fully distribute. 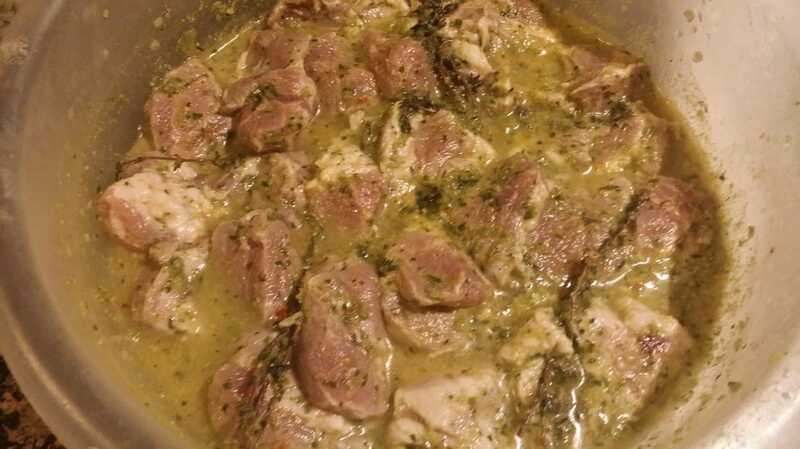 Refrigerate the marinated pork at least an hour or overnight. The longer it marinates, the better it is. 3. 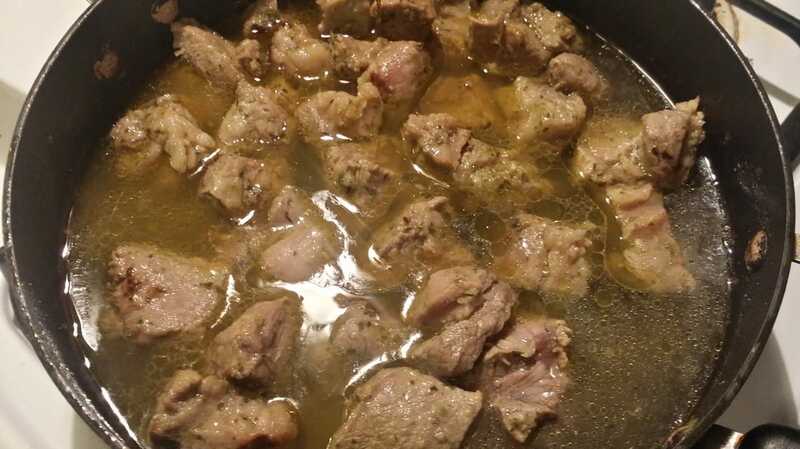 After marinating, transfer the pork into a pot, including the marinade liquid. Add in a few cloves and turn on the heat to high. Place the lid on the pot and let it boil for about 10 minutes. 4. Stir contents and continue to boil with the lid covered until the liquid runs dry. This may take approximately another 10 minutes. 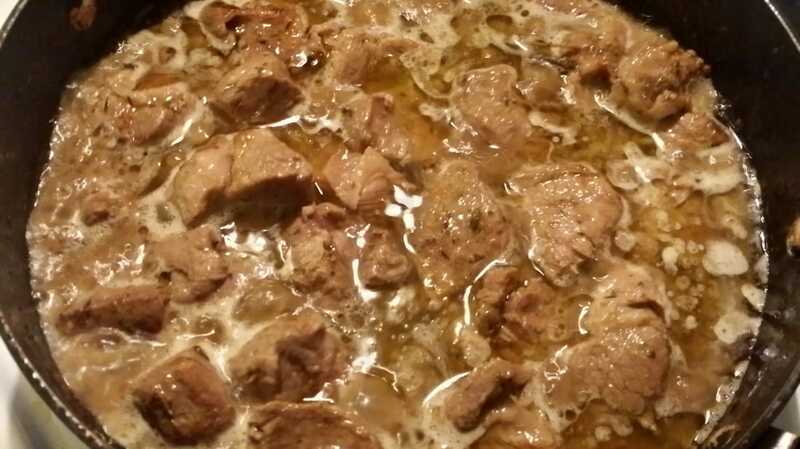 Once the liquid has fully evaporated, saute the pork for about 3 minutes in the oil it has rendered. Then, add 2 cups of water and return to a boil. Replace lid and let it boil until the liquid runs dry once again, about another 10 minutes or so. 5. When the water runs dry for a second time, the meat should have cooked for approximately half an hour. Add in another 2 cups and let it boil for about 5 more minutes. Do not overcook the meat. If it becomes too soft, it will easily break apart and won't fry well. You want it tender but still firm. Overall boiling time should not exceed 35 - 40 minutes. 6. Remove pork from the liquid with a slotted spoon and set aside. 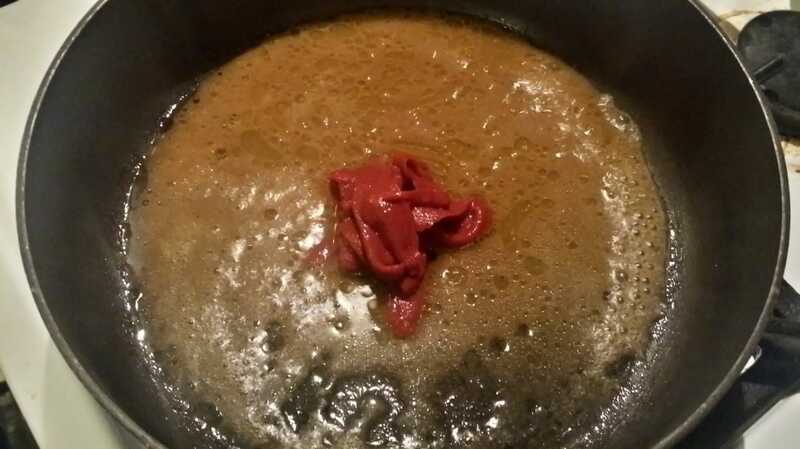 ​*If desired, reserve the liquid to make sauce. 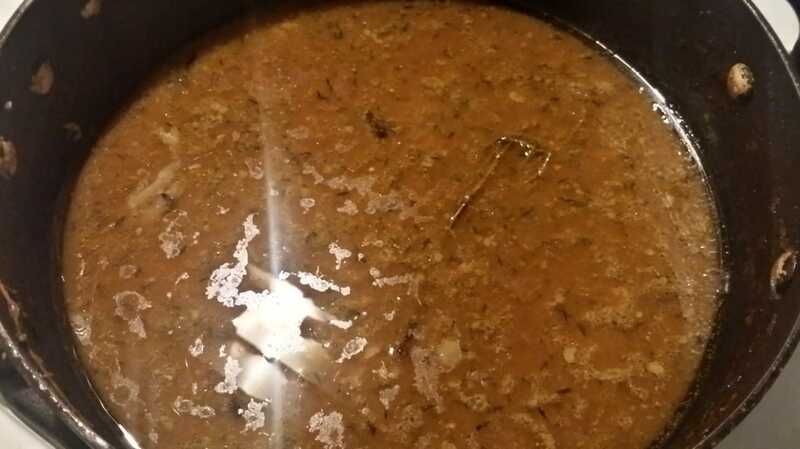 The recipe for the sauce using the stock that remains follows at the end of this one. 7. In a separate pot or pan, depending on it's size, add vegetable oil until the level is about 1 - 2 inches high (about 2 cups). I recommend using a medium sauce pan. You'll need less oil if so. Bring temperature up to HIGH heat. 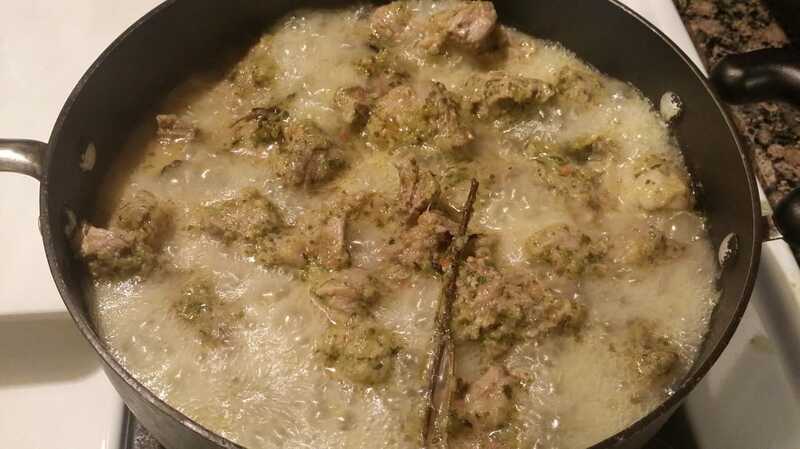 Once oil has has reached temperature, add in pork in batches, being sure not to overcrowd the pan. Fry for about 2 - 3 minutes until they reach a nice dark golden brown color. Avoid frying for too long. 8. Remove pork from oil with a slotted spoon and place on a plate lined with paper towel. Fry remaining batches until complete. 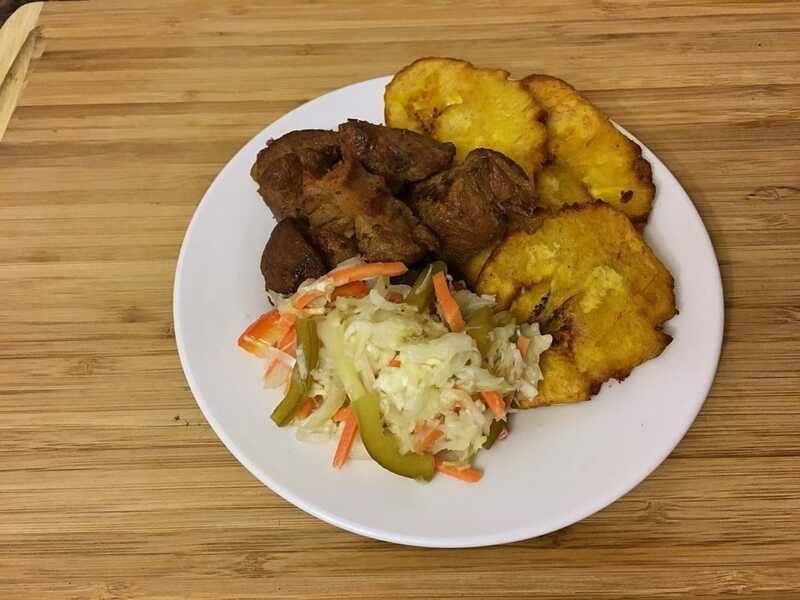 Then, the griot is ready to be served and is best accompanied with "pikliz" and/or "bunun peze". 1. 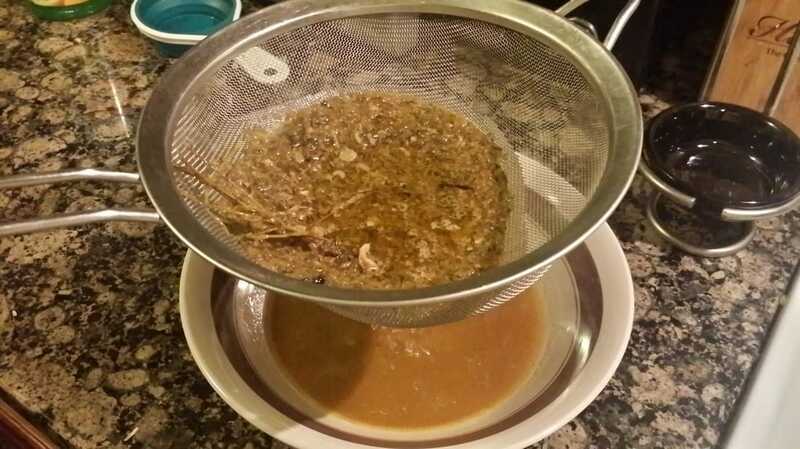 Using a fine mesh strainer, strain the reserved liquid that was left behind into a bowl. Try to avoid letting all the liquid strain through to keep as much oil left behind. Discard the contents left in the strainer. If a lot of oil managed to go through, skim off as much as possible from the bowl. 2. Take about 1/2 a cup of the liquid from the bowl and return it to the pan and add about 2 tbsps. of tomato paste. 3. 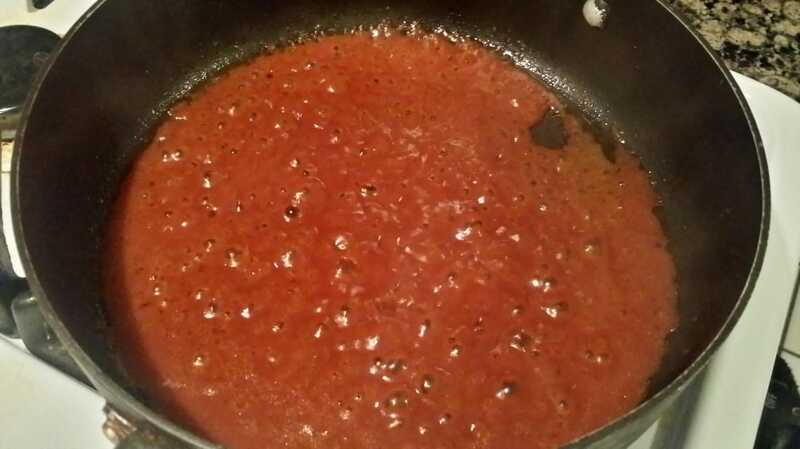 On medium heat, bring the liquid to a simmer and stir the tomato paste until it becomes uniform. 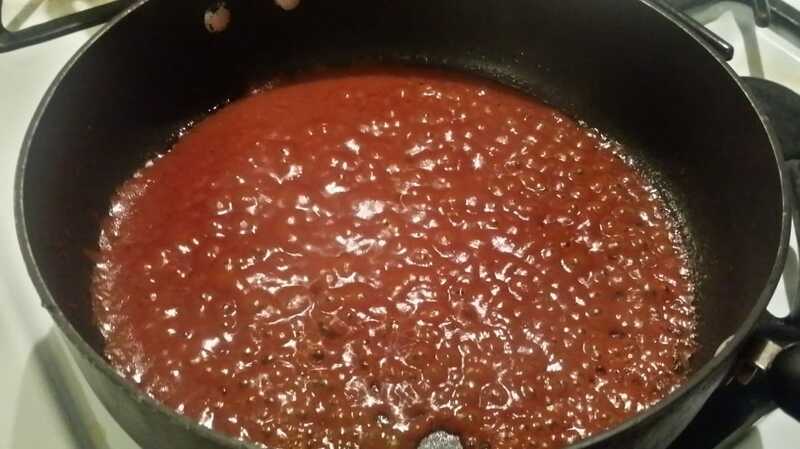 Let the sauce simmer for about 2 - 3 minutes to cook down and thicken. 4. 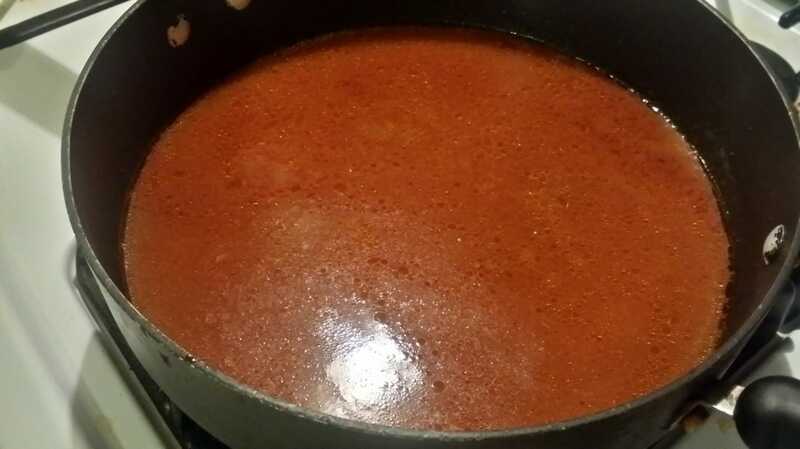 Add in remain stock liquid along with 1 1/2 - 2 cups of water, depending on how much sauce you want to make. Sample the sauce and add salt to taste accordingly. I honestly don't think you will need to add any salt. 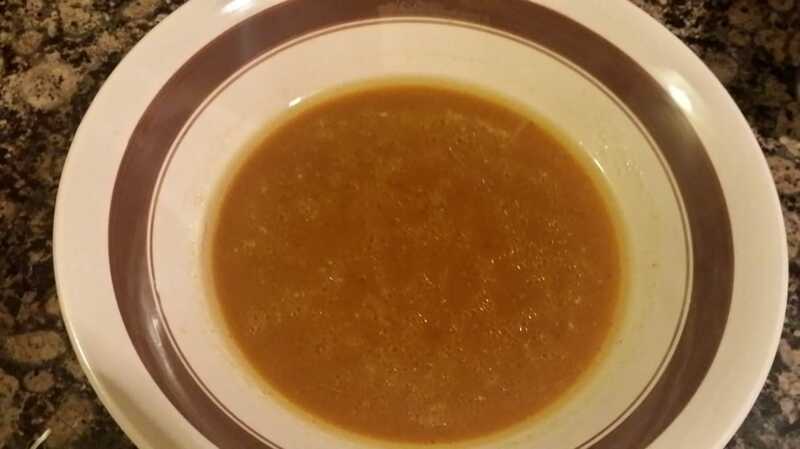 The stock liquid should have been seasoned enough, practically salty, that the addition of the water helped to dilute it. I did add in a little bit of fresh ground black pepper and a dash of oregano for personal preference. 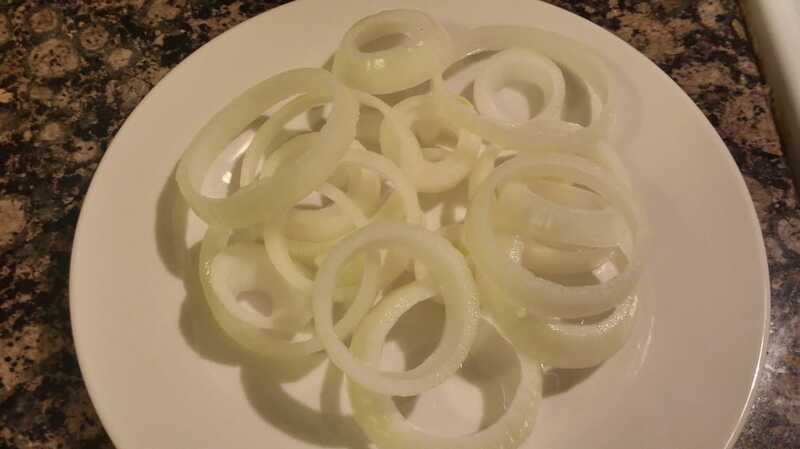 Bring the sauce back to a simmer/boil and in the meantime, slice an onion into rings. 5. 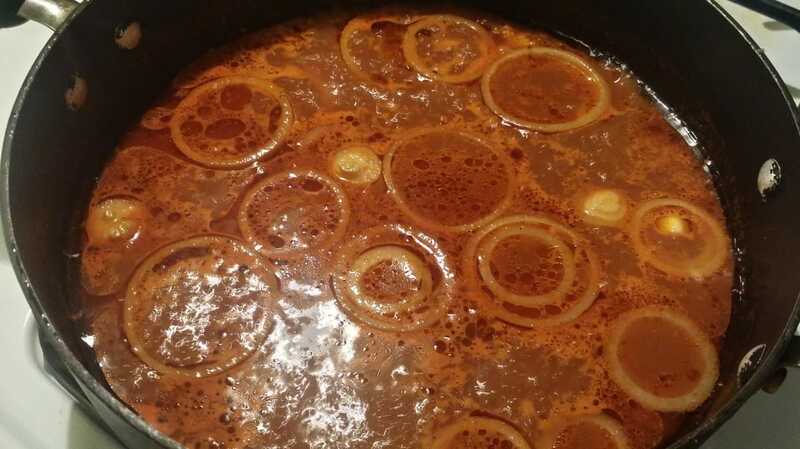 After the sauce boils for about 3 - 5 minutes, add in the onions and turn off the heat. The onions will cook down a bit from the heat but still retain a slight crunch. 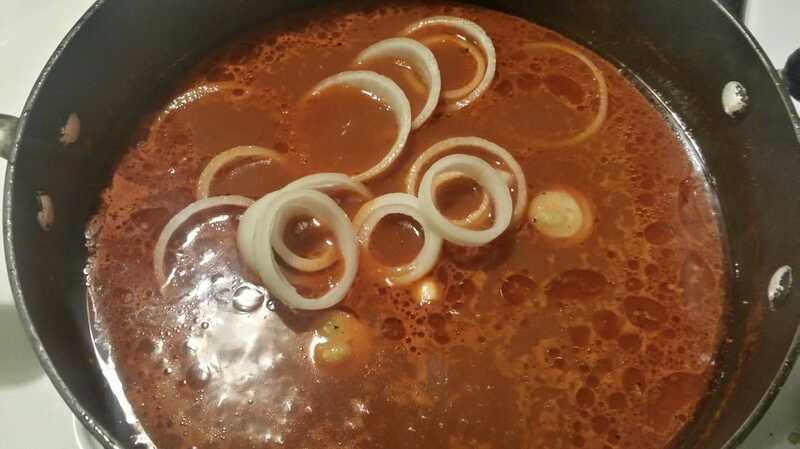 If you prefer the onions to cook down more, then boil in the sauce for a couple minutes before turning off the heat. Afterwards, your sauce is ready to be served. It can be used on meat, rice, or any other Haitian dish that usually calls for a sauce. Griot & Sauce! What are your thoughts on these recipes? How do you make your griot or sauce?